Seems we just can’t get enough of it. I know I’m having fun trying new things with pumpkin…. Like my recent Pumpkin Chili recipe! YUM! 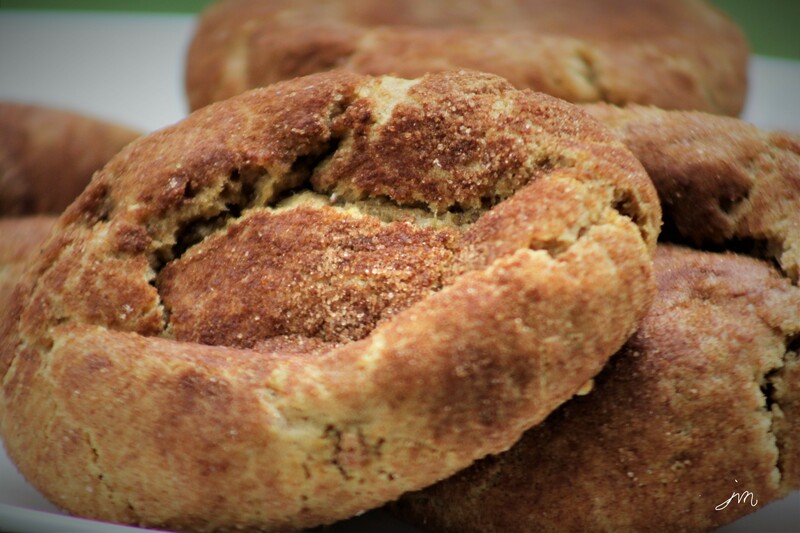 How about a new twist on old-fashioned snickerdoodles by pumpkin’in them up? They just taste like Autumn! Hope you’ll give them a try. Cream together butter and sugars with electric mixer. Add egg yolk, vanilla and pumpkin, and combine. Add next 8 ingredients, followed by the flour, and mix until combined. Roll and shape dough into golf ball sized balls. Roll balls in sugar-cinnamon mixture. Place on baking stone or sheet and bake approximately 12 minutes until tops begin to crack. Remove from oven and allow to cool on baking stone/sheet for an additional 10 minutes. Transfer to wire rack to cool completely. I can’t wait to try these! I just made Snickerdoodles with my granddaughter (9) this past weekend, and they were delicious. WERE being the operative word, haha. Perhaps another round is in order, but this time with your pumpkin recipe. Thanks! I know – I was thinking that too! So often I wish I could send you things that are so easily accessible here. These look great and with a cup of coffee, yummy. Love Snickerdoodles, they’re so crunchy and tasty, your version sounds incredible! YUM!! These sound absolutely wonderful! Yummy Autumn! Wow must say a great recipe, Jodi. Thanks for the share. These look delicious! Excited to make this recipe soon…with a cup of coffee, these might be my new fall go-to for breakfast! Over the years I have made many variations of the traditional Snickerdoodle but never Pumpkin. I’m definitely making these this weekend! Yay! Have fun and hope you enjoy!! One of the reasons for my love of Autumn…PUMPKIN!! Pumpkin anything and everything! I’ve never met a pumpkin that I did not love. I do not limit myself to just this season, whenever possible I use pumpkin all year long. Thank-you for a definite improvement on an already yummy treat! I’m going to go home and do some baking, thank you!! Snickerdoodles remind me of my childhood. These sound soooo good. I will defintely try them! These sound delicious Jodi! Thank you for sharing the recipe! These look fabulous! I love the idea of autumnal snickerdoodles! Have bookmarked it to try. Jenna – for real???? You’ve never had a snickerdoodle!!??? Oh please do try! !